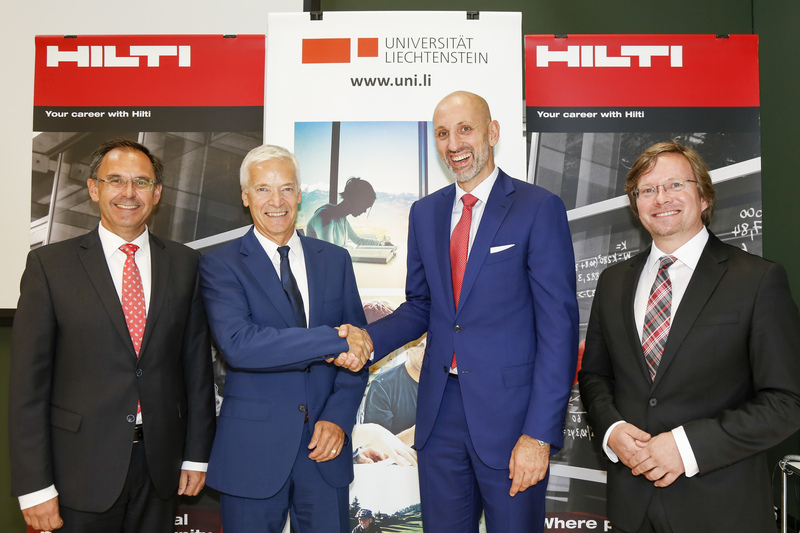 Hilti Corporation and the University of Liechtenstein have extended the agreement for the Hilti Chair at the Institute of Information Systems for another four years. Thereby, both partners continue to provide a solid basis for research and education activities. The aim of the Hilti Chair of Business Process Management, which was set up in 2007, is to enable collaboration between academics and industry through a practical approach. It focuses upon the development of innovative business models by using modern information and communication technologies. Over the last few years, the team reporting to the Head of the Chair, Prof. Dr. Jan vom Brocke, has realized more than 30 projects with regional companies. Four competence centers were set up, funded by the Government of Liechtenstein and regional industry, enabling rapid and direct transfer of knowledge. As part of the Bachelor, Master's and PhD studies at the University of Liechtenstein, more than 350 students so far have been educated by the Hilti Chair. Besides approximately 300 academic contributions in renowned publications, the Chair has published a number of specialist books that today are considered standard academic literature. They have sealed the collaboration for a further four years (left to right): Klaus Risch, member of the Management Board for the Martin Hilti Family Trust, Klaus Näscher, Rector of the University of Liechtenstein, Jörg Kampmeyer, member of the Hilti Executive Board, Prof. Dr. Jan vom Brocke, Head of the Hilti Chair. A recent example of this is the upcoming introduction of the new Data Science course. This specialization on the Master's program was developed together with regional industry and injects practical know-how on the subject of Big Data into the curriculum. The effective management of large amounts of data is also an important issue for the future at Hilti and is being driven forward in a project with the Chair. From a business perspective, the contact with junior talents is also extremely important. The internationality of the students and the academic networks of the Chair open up additional recruitment opportunities. Furthermore, the Fellowship programs offer selected Master's students the opportunity to become part of an international project team for a semester while also attending seminars at the University of Liechtenstein.